My husband, Paul Wauters, and I met in the Studio Arts building in March of 1981. We were both returning students in our late twenties. He was a union carpenter and I was a social worker but we were now students pursuing our individual desires to be an artist. We shared art history and sculpture classes that semester. During break from our three-hour studio arts sculpture class, taught by Tom Tasch, we had our first real talk. We shared a Coke in the Studio Arts Commons area and Paul asked me out for a first date. He had invited me to meet him at the BlueWhale Coffeehouse that night to see the Big Yellow and the Mellow Fellows. But I got cold feet and stood Paul up. I knew I had made a big mistake the next day. To make a long story short, we eventually did go out for our first date, a Fellini Film playing at the University. We have been together ever since. We will be celebrating 33 years of marriage this year. 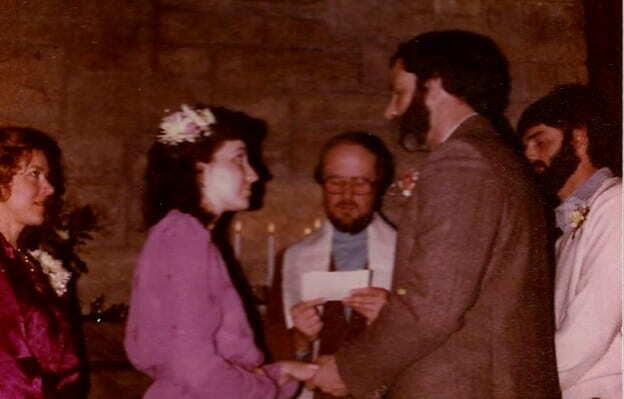 We chose to get married during winter interim on January 30th, 1982. We asked Father Stephenson from the UW Ecumenical Center to officiate our wedding at the BlueWhale Coffeehouse. We pleaded with the UWGB food services team to cater for us because we loved their chili and wanted an informal buffet style reception. They agreed and did an amazing job, creating beautiful fruit kabobs, veggie trays, plus chili and sandwiches. Our service was held in front of the fireplace by a roaring fire. Our friends Lee Nichols and Jim Kramer provided live folk music throughout the night. We rented a champagne fountain filled with French Champagne as our big splurge. It was a beautiful setting that meant a great deal to both of us. I graduated in Spring of 1982 with a B.A. in Communication Arts. Paul graduated in January 1983 with a B.A. in Studio Arts. We both went on to have very successful careers in the arts and sincerely treasure our memories of UWGB, especially the BlueWhale Coffeehouse. Thank You!! This entry was posted in Shared Stories and tagged bluewhale coffeehouse, shorewood on October 9, 2015 by usersubmittedstory. It fell into disrepair and was torn down in 1987, but ask any 1970s Era alumnus of UWGB for his or her favorite memories and it’s almost certain to include the word “Shorewood.” On an under-construction campus that had few buildings at all until the mid-1970s, the former Shorewood Country Club clubhouse was a mecca for students, serving as the student union and semi-official hangout. This entry was posted in Phoenix Phactoid and tagged facts, shorewood, trivia on August 24, 2015 by Christopher Sampson. 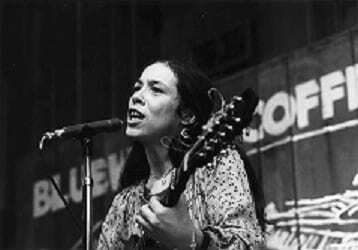 For UWGB students in the ’70s and ’80s, the BlueWhale Coffeehouse was an artistic hub drawing musical talent from Chicago, Minneapolis and other Midwest cities. Launched in 1972, the BlueWhale attracted a significant audience of local musicians, making it the go-to destination on the new campus for live music. Coordinated by the Good Times Programming Board, the BlueWhale charged $2 for admission, 50 cents for UWGB students with student IDs. The stage was small, surrounded by old chairs, hand-me-down couches, and a barn board sign that read, “Bluewhale Coffeehouse.” Although it maintained popularity through the 1980s, a deteriorating Shorewood Club was to be torn down in 1987 and along with it, the beloved BlueWhale. This entry was posted in Phoenix Phactoid and tagged café, facts, shorewood, trivia on August 15, 2015 by Christopher Sampson.